Hours after a federal judge issued a stay on President Donald Trump’s executive order temporarily restricting entry to the U.S. from seven Muslim-majority countries, the Department of Homeland Security (DHS) and a senior White House adviser issued robust responses, emphasizing that the order remains in force. The responses came just hours after federal Judge Ann Donnelly of the Eastern District of New York granted an emergency stay on parts of the order late Saturday. Her ruling came in response to a lawsuit brought by the ACLU on behalf of two Iraqi refugees who had been detained at New York’s John F. Kennedy airport. Who is affected by Trump’s executive order? Green card holders from any of those countries currently outside of the U.S. will need to report to a local U.S. consulate for “extra vetting,” and admitted or rejected on a case-by-case basis, according to administration officials. 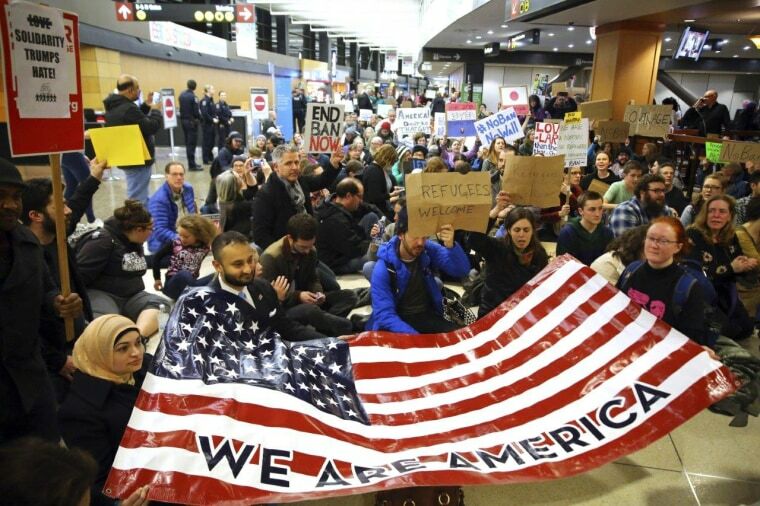 While a dozen travelers were being held at New York’s John F. Kennedy International Airport on Saturday after they arrived, many more across the world were told they would not be able to board connecting flights to their destination in the U.S.
Amir Rashidi, an Iranian immigrant who lives in Seattle, told NBC News that his mother — who had become an American citizen — sponsored his sister’s family to come to the United States. They had all obtained green cards, a process that can take years. All but one arrived safely in Seattle. Rashidi’s niece, 27-year-old Mahsa Fazmali, was slated to arrive on Friday, but then Trump signed the executive order. “She was on the plane sitting on her seat,” her uncle said. Rashidi said his family doesn’t know what to do. They have not told his mother because they believe it would be too much for her to handle at her advanced age. “We don’t know where to call or who to call really,” the uncle said. Iraqi immigrant Bnyad Suleiman, 19, said his entire family was stopped in Cairo before they could board their flight. He, his parents and two sisters obtained Special Immigration Visas. His dad worked as a translator in Northern Iraq for USAID and heard that the administration might sign this executive order. "Everybody was panicking because they had organized their whole lives around (emigrating to the U.S.)," said Bnyad. The Sulemains’ moved up their departure date, but they didn’t do it in time. They weren’t able to board their flight and will be put on a flight back to Erbil, Iraq, on Sunday morning. Bnyad said his family plans to contest the decision once they return home.